The Universal Lectern Series offers high-tech innovation in a "traditional looking” podium. 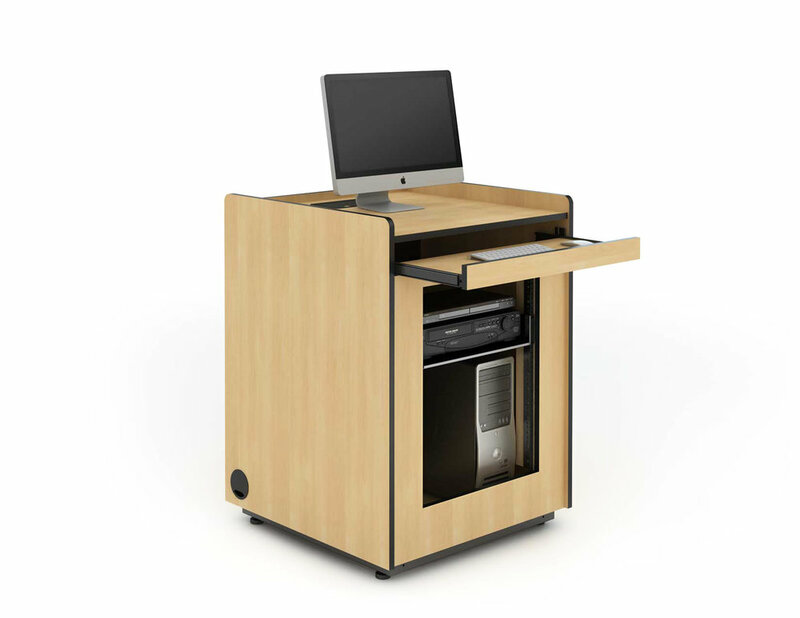 This cabinet-style option offers maximum flexibility for all electronic teaching tools. If an instructor chooses to bring their own laptop computer to class, this workstation includes tabletop power plugs and cord manager for holding laptop connectors (VGA, RJ45, Audio, USB, etc.). Designed for tight space requirements (30” x 30”footprint). Flip-up side surface is ideal for document camera, extra workspace or wheelchair keyboard platform. 24”H rack opening is included on the face of the cabinet for mounting flat shelves or equipment (CPU, VCR, DVD, controller, amp, etc). A locking rear access panel is a standard feature for this cabinet. Universal Lectern 1 (30W x 30D footprint) to include: Front rack rails and locking rear access panel. This unit is 38"H.
Universal Lectern 30" x 30" with pull out document camera drawer (LEFT-SIDE), 8 space front rack and locking rear access door. Universal Lectern 1 (30W x 30D x 38H footprint) to include: Front rack rails and locking rear access panel. KEYBOARD DRAWER INCLUDED WITH THIS UNIT.